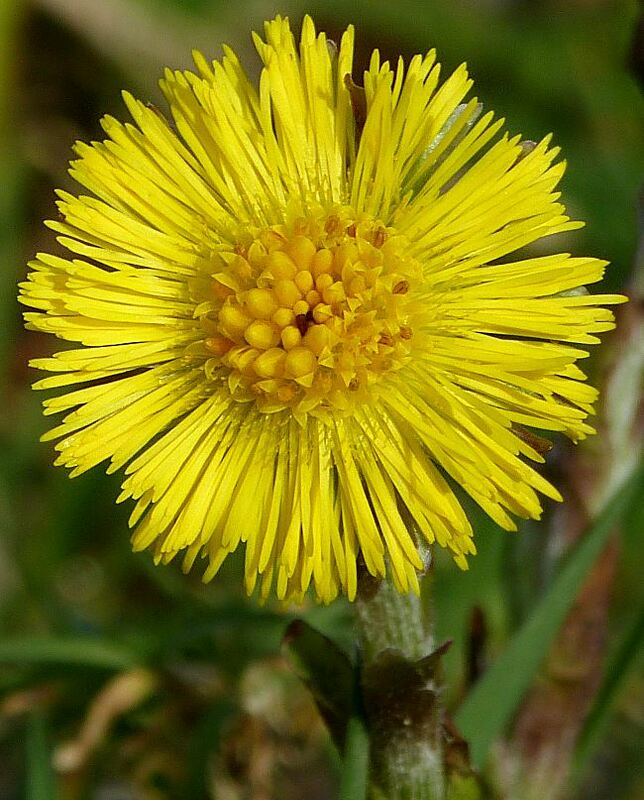 Coltsfoot is a cheerful sight along road and path sides in March, being one of the earliest plants to flower. When the flowers appear there are no leaves, just scales up the stem. The young leaves begin to appear after the flowers are out. Coltsfoot growing in sandy soil at the head of Loch Feochan. It is usually found in bare damp places, often on road verges or other disturbed ground, but also on mud or gravel beside burns and rivers. The flowers are a bit like those of Dandelions but have a bundle of tubular florets in the centre, like a Daisy, with ray florets all round the outside. Dandelion and similar flowers only have the ray florets. 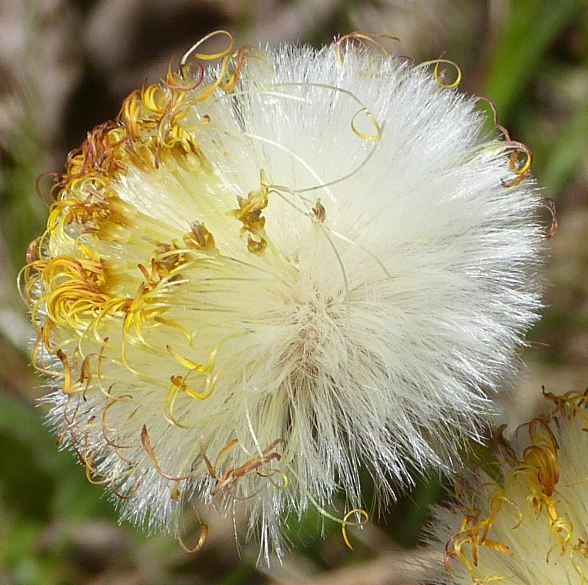 The tubular florets in Coltsfoot have nectar to attract bees, but it can pollinate itself if there are no bees around. The stems are upright when flowering, then droop after flowering, and become upright again when the seedheads form. For photos of this and of the leaves see Coltsfoot page on West Highland Flora. The fruting head is like a Dandelion “clock”. Each seed is attached to a feathery pappus which enables it to blow away in the wind. Please send in your Coltsfoot sightings using the form below, or email sightings@lnhg.org.uk with the details if you prefer. If you are not sure of the identity of your plant, please send a photo to sightings@lnhg.org.uk, or put one on the LNHG Facebook page. By filling in this form you consent to your record being passed on to the appropriate recording scheme. Your email address will not form part of the record and will not be passed on to anyone. All photos and other content copyright © Carl Farmer except where stated.